Now's your chance to enroll in the exclusive and secret Kittywort's School of Magic. Click here to play! Learn to cast a spell with these felines and you could conjure up plenty of money! As a student of magic, you'll need to pay close attention to Master Tom. This head cat not only acts as a substitute, but he will also multiply your winnings by five times if he appears in a winning combination! You'll also want to stick close to your fellow kitty students. Leo, Catrina and Baz are your classmates and will bring in up to 2000, 1500, or 1000 coins respectively if you can spin two or more of each of them across a pay line. Also helping you in your magical quest are plenty of other symbols, including the school's crest, the schoolhouse, Professor Hedgehog, school bags, books, potion equipment, parchment and quills, and lunch! Spin two or more (three or more in some cases) of any of these symbols across an active pay line to bring in the money! The ultimate symbols in this game though are the M-A-G-I-C symbols. 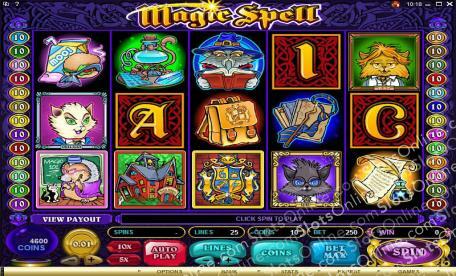 Spin each of these left to right on the reels to trigger the Magic Spell Bonus. Also, if you can find the golden key symbol, you will trigger the Secret Library Bonus. Each of these extras will reward you handsomely. Become a student of magic and learn how to spin these reels just right in order to bring up plenty of magical wins! Master Tom will substitute for the three kitty student symbols to help you create more wins. He will also multiply your prize by five if he appears in a winning combination. There are a couple of bonus games in this magical game. They are triggered when M-A-G-I-C appears anywhere on all five reels. During the first bonus game, you will choose one of the letters to reveal a prize and you are taken back to your slot game. The second game is triggered if you choose a card an reveal the golden key. You are then taken to the secret library in which you will have to choose from a selection of books to reveal your bonus prize.